Nick Annitto is an outstanding lacrosse player. The rising senior attackman/midfielder at St. John the Baptist (N.Y.) is a versatile player who is an effective dodger and finisher who is equipped with good speed. But when it came time to choose a college, Annitto weighed academics equally with athletics. The final result was a decision to attend Wesleyan University, a commitment that was first reported by Joe Lombardi on LaxLessons.com’s “Lacrosse Insider” section. The 5-foot-10, 160-pound lefty’s final list of schools were all strong programs as well as academic institutions that showed as much interest in Annitto as a student as a player. Now, here’s a Q&A with Nick on his commitment. Wesleyan is an outstanding school and the NESCAC is a top lacrosse conference. The combination of academic excellence and competitive lacrosse is a perfect fit for me. Once I met (Wesleyan Head) Coach (John) Raba, I knew Wesleyan was the place I wanted to be. I was impressed with campus and all the opportunities Wesleyan has to offer both during and after college. USMA, Hamilton College , Dickinson College and Vassar College. I visited all of them. All of the coaches I met were outstanding and I really appreciated all of the interest that they showed in me and all the time they spent with me, both as a student and as a lacrosse player. 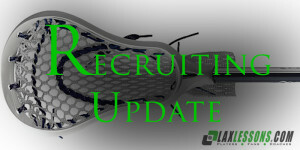 I was most impressed by the emphasis the coaching staffs placed on academics and the life after college lacrosse. I use my quickness and speed to beat defenders. I can dodge from anywhere on the field and can also finish from all over. I am a team player and like to create offense in any possible way. Team Long Island. Coach (Michael) Gongas and Coach (Scott) Reh are great coaches. I can’t thank them enough for all they did for me. They worked incredibly hard to make us winners, both off and on the field. We won some of the top tournaments because we were coached and played as a team. I want to thank my parents, who supported my goal to be a college lacrosse player, and my little brother Chris, who comes to every one of my games and is my biggest fan. I’d also like to thank my St. John’s coaches, (Head) Coach (Larry) Collins and Coach Isnardi for believing in me as a player and continuing to make me better. I’d also like to thank Coach (John) Greaney from Babylon, who was my freshman coach and friend. He helped me a lot during the recruiting process. My teammates at St. John’s and on Team Long Island are also great friends and we played hard and believed in each other.